A Great Toe Metatarsophalangeal Joint (MTPJ) Cheilectomy is a minor Daycase type operation to gain movement of the toe with good pain improvement. In principle the surgery removes the extra bumps of bone (Osteophytes) and limited amounts of severely damaged joint surface on the top and around the Great toe MetaTarsoPhalangeal Joint. It allows increased joint movement, and is successful in reducing pain symptoms in about 90% of patients with less severe Osteoarthritis. It does not halt the progression of arthritis unfortunately but can ease the pain in the Short to medium term. It’s main advantage is that preserves your own joint and its movement with pain improvement. Later stages of arthritis require more involved surgery such as a fusion or possibly a replacement. During the operation the range of motion of the joint will be repeatedly assessed to get an optimal outcome. Often 1/4 to 1/3 of the joint surface will be removed from the top to achieve this. Occasionally a small extra procedure releasing slightly the tendon attachment from the under surface of the toe base (Proximal phalanx) will be performed at the same time. This is called a FHB (Flexor hallucis brevis) plantar recession. It can only really be judged necessary at the time of surgery. This operation is usually undertaken as a Daycase procedure. The toe or occasionally the whole foot will be made numb with local anaesthetic. As well as this you may receive light sedation or choose a general anaesthetic. To get to the bone an incision is made which is sewn together at the end. This is usually closed with absorbable sutures. 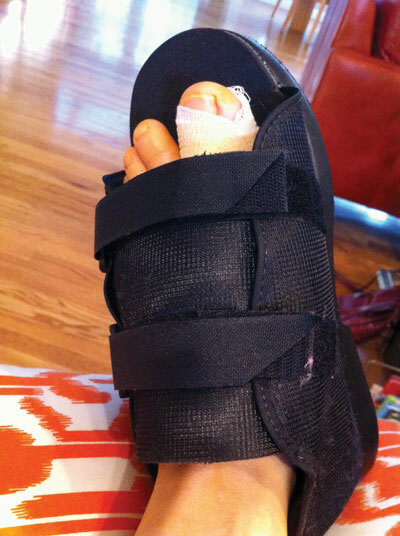 Your foot will then be wrapped in a compressive bandage and a rigid soled surgical sandal applied before you go home. You will be monitored by the nurses on the ward for an hour or two at least until you are safe to go home. You must have adult partner or friend who will be with you for the initial 24rs at least. The local anaesthetic will wear off after approximately 6-8hrs but this is variable. The key thing is to take some painkillers as soon as sensation starts to return before the predictable pain kicks in. Paracetamol, distalgesic,or a mild anti-inflammatory should suffice. For the next 2 weeks elevate the foot whilst reclined ‘Toes above your Nose’. This elevation will minimise swelling and help the wound heal well. Recline and use pillows to keep the foot ideally above the level of your hip. Walking with full weight on the sandal on is OK but only for essential activities. Treat the sandal like a plaster cast and leave it on, even at night. The straps can be adjusted for a comfortable and stable fit. 2 weeks - This check is about making sure the wound has healed well with no evidence of infection. You will also be guided on scar softening techniques including moisturising. After this wound check you will be instructed to exercise the toe. Take hold of the toe with your own hand and move it up and down as far as is sensibly comfortable. Repeat 10- 20 times and do this 3 times a day at least. Wean into softer soled shoes and even walk barefoot if comfortable. When able begin repeated tiptoe standing or walking exercises to encourage movement back to the joint. 6 weeks A check on your progress and advice regarding returning to recreational activities etc. I recommend a minimum of 2 weeks off work to allow the rest and elevation. After this you may return as comfort allows and your workplace permits. We recommend a minimum of 2 weeks off driving to protect the operation and allow wound healing. After this you are unlikely to damage the surgery and hence,if you feel safe and in control of your vehicle, can return to driving. Please check with the DVLA if uncertain. Are there any risks of a Cheilectomy? All surgery carries risks which must be weighed up against its intended benefit. Cheilectomy is a straightforward and relatively minor procedure but the below are recognised complications. Nerve damage. The scar will be numb initially but will usually settle. Occasionally if the nerve is trapped in the scar tissue or damaged an area beyond the scar may remain numb longer term. Tendon damage. The operation is performed very near to the tendons of your great toe. Occasionally they can become sore or even tear from damage. Recurrent or Persistent symptoms. Arthritis is a progressive condition and it is quite likely that at some point after this surgery your symptoms will return. This can vary from months to years. The satisfaction rate of this operation approaches 90% but that does leave 1:10 people dissatisfied to a variable degree. Stiffness of the Joint. Any surgery results in scar tissue and this can stiffen the toe as it heals. To help minimise this do adhere to the exercises mentioned above. Loss of Toe. An extremely rare risk and mentioned out of completeness. Can be associated with blood supply problems or deep infection. This is of more significant risk if you’ve had previous surgery to the same toe. Thrombosis/DVT/Blood clots. A rare risk with this operation, however you will be given advice regarding early other joint mobilisation, ensuring you stay hydrated and the use of special stockings. It is important that you notify a qualified nurse or doctor if you get a persistent increase in pain after you go home, that does not settle with elevation and mild painkillers, as this may indicate early infection. Any high temperature or fever should also be alerted. Most problems can be treated by medications, therapy and on rare occasions by further surgery, but even allowing for these, sometimes an unsatisfactory result ensues. For this reason we do not advise foot surgery for cosmetic reasons. The level of symptoms before surgery must be worth the risk of these complications. We also generally advise against preventative surgery (surgery to avoid problems that are not yet present). If you are at particular risk of a complication, this will be discussed with you. If you have any general or specific worries, you should ask before the surgery day and I will explain it to you. Having a toe bone realignment procedure (Google -‘Moberg Osteotomy’).